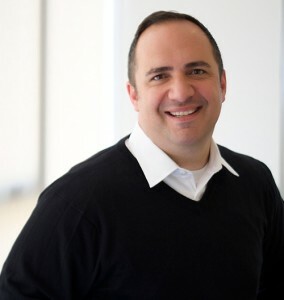 If you have a meeting with Aaron Sherinian, bring your oxygen tank as he sets a very brisk conversational pace; you can bet you will never be bored in his presence. Aaron is a dynamic blend of two divergent cultures: Armenian (grandparents were refugees fleeing the Genocide) and Scottish/English (Mother is a Mormon from pioneer and Civil War stock). His parents married as widow and widower, blended their families and produced Aaron as the exclamation point on the two daughters and one son from their previous marriages. Aaron and his wife Emily both have three siblings, and they have carried on the family-of-four tradition with one son and three daughters. Aaron treasures the family unit and has expanded the concept to include all of human kind. He is the world’s most beloved, bold, dynamic, well spoken and energetic godfather. He obviously feels a deep responsibility for humanity and has made a career of communicating and inspiring people to improve the lives of the most disadvantaged. He works across borders and time zones to create conversations that will make the world a better place. He loves bridging the gap between large corporate citizens and social welfare. Aaron runs Marketing and Communications at the United Nations Foundation where he builds media content, coverage and understanding of the United Nations’ Global Goals. Some of the cause engagement brands Aaron has introduced include the Global Moms Challenge, Social Good Summit, #GivingTuesday, Earth to Paris, +SocialGood, International Day of Happiness, Shot at Life, Nothing but Net and Girl Up. He currently leads an ambitious 15-year plan with a broad coalition of media partners and journalists to ensure that global development stories and issues appear “above the fold.” His team has crafted a partnership and program to train 1,000 journalists a year to raise the profile of the the work of the UN, global development innovators and their partners. Aaron is tremendously excited to be reshaping the message of global development while the media world itself is changing. Aaron requires extra pages in his passport, as the world is his territory. While in India attending a meeting, Aaron found himself seated next to a six-year old girl. They could not communicate with words so turned to pen and paper to sketch a conversation. 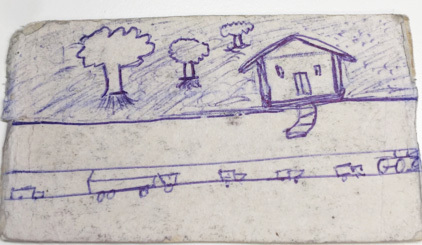 The first picture they each drew was of their home and their family. This reaffirmed Aaron’s premise that everyone wants a safe place for their family to call home. He keeps this picture in his wallet as a reminder of what matters most, to himself and to others: love, security, safety and belonging. Of course, Aaron considers his UN Foundation team members of his extended family and works diligently at mentoring them. In fact, he dreams of one day working for a former intern who has reached the corner office in a global organization with at least a double bottom line. If he does indeed get hired by someone who once worked for him, he will know that he got the boss thing right. See more of Aaron’s indomitable energy and wonderful mastery of the English language at globalextrovert.com. My mom told me “Aaron” was a challenge to be a “speaker for your people.” Hess, my middle name, is derived from the Armenian name of my grandfather, Hassu, who changed his name when he came to the States. In order to make ends meet as an Armenian refugee, arriving here after fleeing the Genocide, he took up prize fighting and was dubbed “Hess the Kid” at one point. The name stuck. And has been given to me. And my Dad. And my son. And I hope his son…. An architect. As a young boy I loved designing buildings on scratch paper, books and anything I could get my hands on. And I also wanted to own a Department Store. SO I guess the dream was to be a blend of IM Pei and Mr. Selfridge. I have always loved to build things. And sell things. And be with people. Exactly what I am. Maybe in a pant size a few inches smaller. But exactly what I am. I would have taken more time during paternity leave. You never get that time back – and it matters…for your family and for your team at work. And I should have pushed harder for more. Both for my family and for the men in the office who were having kids after me. I was unwittingly sending the wrong message by only taking the allotted amount of time without lobbying for more. My bosses would have gladly allowed it. I left those days on the table. Douglas Rushkoff’s book Present Shock about what you do when “everything happens at once” in a new media era. Love, love, love it. I just completed Alec Ross’ Industries of the Future and at home I started Bold on the road. But the really interesting stuff happens during “tuck-in time.” I am reading the Magic Treehouse Series with my kindergartner and every night this week my other daughter and I read The Day the Crayons Came Home (HILARIOUS…I highly recommend). I read passages from the Book of Mormon and the Bible every day. These scriptures are essential parts of my life. And I read them mostly on my phone when on the road. There are amazing apps today that allow you to study in a way that is both modern and meaningful. Easy. Italy. In a heartbeat. I love it so much. Raising four teenagers. Seriously. At some point they will all go through teen years. Wow. Parenting is a challenge and joy at every stage…but I need some new skills before all of the kids hit the teenage era. Sparkling water and expensive cheese. Although I believe both have medicinal value for my mental health! The ability to help people forgive each other. Some people have this. It’s a real gift. Oh, and teleportation. Would come in quite handy about now. My daughter Julia. She fully expects to be hosting a dinner there someday (as Commander-in-Chief), so she may as well see how the President does it now and get a clearer idea. Back-up for Aretha. Who wouldn’t! ?